When I first came to Fillmore Country as a young teacher in the 60's I was surprised to learn it was without a lake or reservoir. Plan B was to learn fly fishing in the many nearby limestone spring creeks. 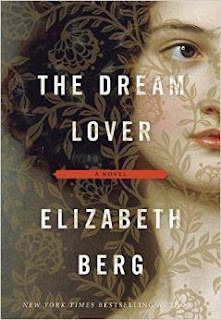 That became a life long passion which I passed on to my two sons, even carrying it to the distant mountains of southwestern Montana and their rivers and blue ribbon trout steams. Along the South Branch of the Root River near Forestville State Park. 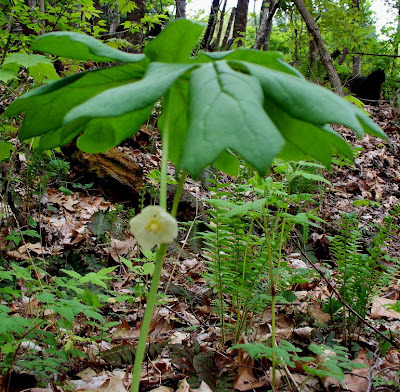 These are Mayapples and the English called them mandrakes and English folklore says they scream when pulled from the ground! As you can see , the white flowers cannot be seen from overhead and so I had to lay down on the ground to photograph them. I did think the umbrella like stalk and leaves have a somewhat tropical effect. Thus my "jungle" fantasy. The plants beyond the mayapples are lily of the valley. 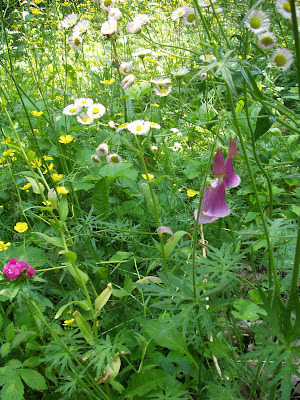 These plants both represent the third year of my effort to restore a woodland garden effect to the north section of our property. It's been a long struggle to remove the prickly ash, gooseberries, burdock and other invasive plants from the area. The south plot is in its sixth year. 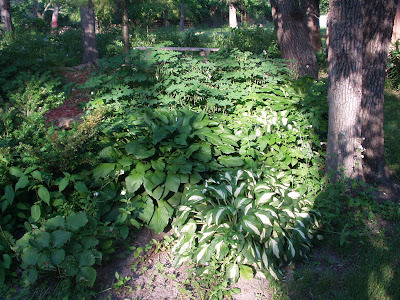 Also, beyond the overgrown woodlots is my intent to reduce grassy areas, fertilizing, herbicides and mowing. Yes, I'm trying to be more "green." I must admit some of the flowers I am already seeing, I don't have a clue as to what they are. I cleared brush, did some burning and in the fall threw some seeds on the ground labeled "shady wildflowers." So be it. I'm not going to be a native restoration type of purist either. 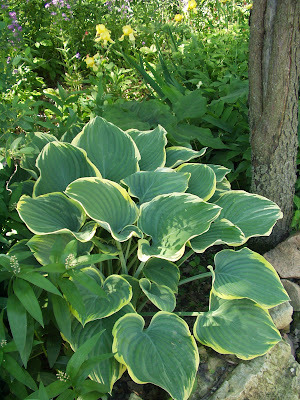 Mrs T loves hostas. I do too. Japanese "aliens" are more than welcome here. 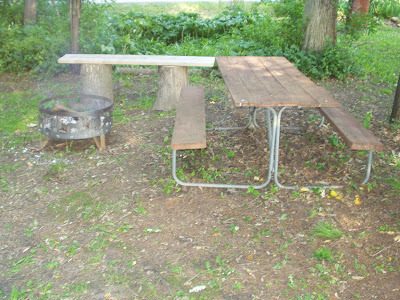 Finally I built some simple benches, restored an old picnic table and added a fire ring. This project is turning out to be a lot of fun and I'm just getting started! 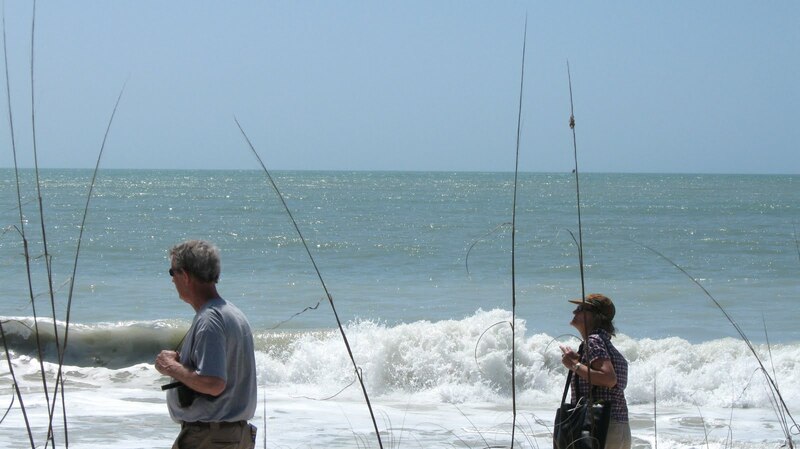 A few years back The Troutbirders along with friends Gary and Rosie made their first trip to Florida. The birds, animals, and landscapes were fantastic. 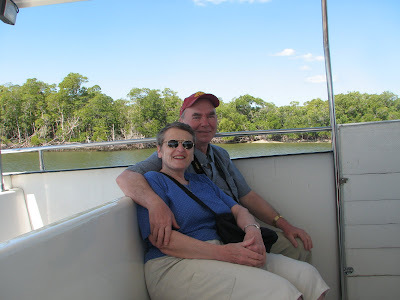 We saw lots of alligators.... What we didn't see were ferocious canines. The alligator normally considered the "apex predator", can still fall victim to a 'team work' strategy often implemented by dogs. This is made possible due to the tight knit social structure and "survival of the pack mentality" characteristic of canines. 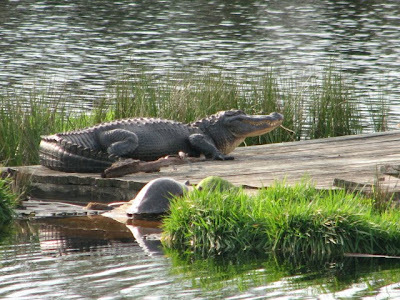 Killer gator photographed by Mrs. T near Ft. Meyer. See the remarkable photograph below courtesy of Nature Magazine. 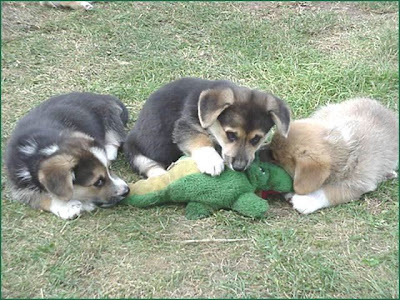 Note that the Alpha dog has a muzzle hold on the gator preventing it from breathing, while another dog has a hold on the tail to keep it from thrashing. The third dog attacks the soft underbelly of the gator. Not for the squeamish !!! !